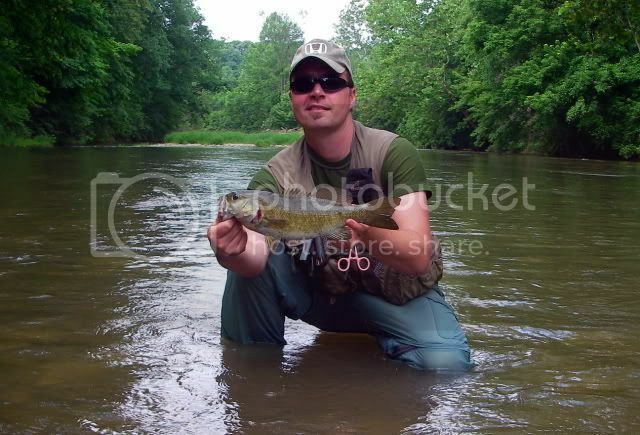 Smallmouth in Your Soup: RAIN!!!!! Fish somewhere on the 4th of July? Heck ya, America! Unfortunately, all the target zones close enough got dumped on Wenesday and Thursday between 1.5-3" more inches of RAIN!!!! We passed several scratches on the way north to our destination, stopping at each one to sample visibilty and flow height, mostly on the way to chocolate milk. One in particular had barely spiked so off we went. None of the guages were too crazy but turbidity would kill the topwater bite we wanted. Mike and I arrived at the stream and were immediately impressed by the riffles, rockshelves, grass islands, midstream boulder fields. The best of all, 12" visibility that actually improved to close to 18" as the sun came out and the day went on. The stretch was amazing and just begged smallie habitat. The 17th Indiana Stream I've caught Smallmouth bass out of this year was one of, if not [i]the [/i]prettiest. Unfortunately, due to limited visibility, cold front, or just angler ineptitude, the fishing stunk. We threw the kitchen sink. Mike ended up with 6 dinks and a White bass, I had 7 SMB including one 16.25", the lone decent fish of the day exploding on a splashtail. That one fish kept us from dee-deeing much earlier. Just so frustrating to see such great habitat and fish with lockjaw. Jeff Blakely and John B probably remember this one from the last rodeo where they slayed them. Mike's also got a pic of the stream. Hopefully he'll pitch in and post it. Been a run of bad luck for us as the last 4-5 trips have been clunkers often because of turbidity... Dude has completely missed the brief periods of stability between downpours. I also tried some Sufix 20/6 braid. At first, it was a little rough trying a new line, by the end of the day I was getting back in line with it. Seems thinner than Power Pro, 'slippery', and a little stiffer. They have rebates 6-10$ on the stuff for now so I gave it a go. Anyone else think the 20" of rain since June 1 are a bit rediculous?